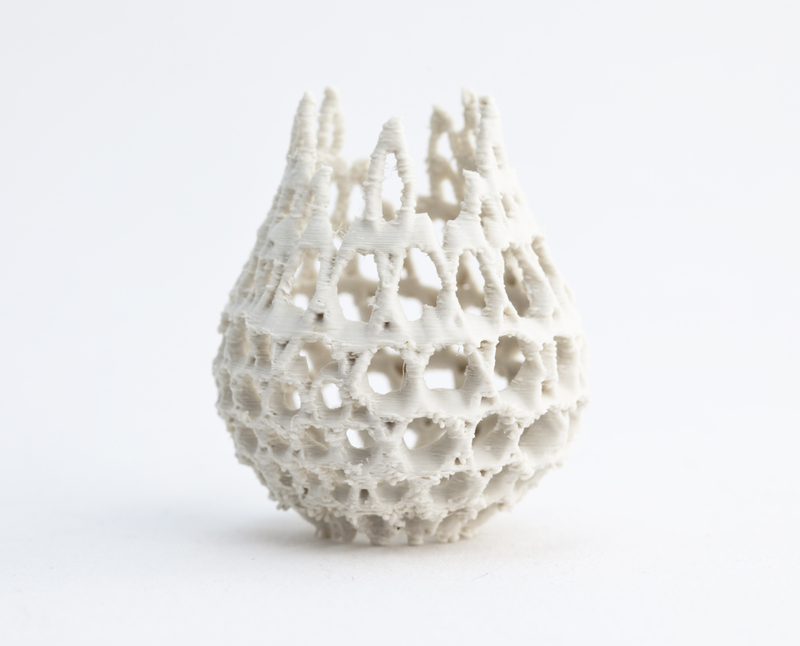 PLA (or Polylactic Acid) is a great material to print with on the Ultimaker – in fact I would go as far as to say it is the recommended material to print with, especially if you’re just starting out. It has a lower melting point than ABS, and does in theory not need a heated bed to get good adhesion. It is ecologically sound and made from renewable resources such as corn starch or sugarcane. It comes in a rainbow of colours and some very cool speciality filaments (thermochromic, UV active, glow-in-the-dark and fluorescent to name but a few). It also does not smell as strongly as ABS when printing. You can even shred any failed prints and re-extrude them into beautiful fresh reels of filament if you happen to have a Filastruder. As a downside, it is not as structurally strong as ABS or Nylon, so if you are making high impact engineering parts it might not be your best choice. Ditto any parts that need to withstand higher temperatures – the glass transition temperature (where it starts to go soft) for PLA is around the 70C mark, meaning if you were going to pour hot water into a receptacle made from PLA it would start to deform – not an ideal scenario. There is also the issue of long term material degradation – it has a limited shelf life, and in time parts printed with it will start to become brittle. I have not yet witnessed this effect personally, so it is not really a deterrent for me. PLA is also quite difficult, if not impossible, to print with an all-metal hotend, as clogs can form as a result of the higher operating temperature. The Ultimaker hotend is not all metal, so very well suited for PLA. Stringing and oozing are also more of an issue with PLA, due to its slightly ‘softer’ texture, but this can easily be countered by adjusting the retraction settings in your slicer software of choice, Cura in my case. 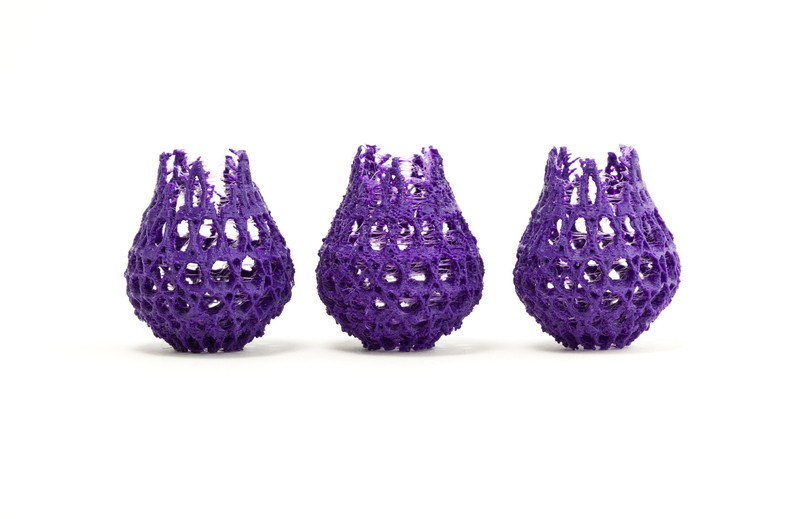 Faberdashery Filament in (from left to right): True Lagoon, Space Marine and Princely Purple. 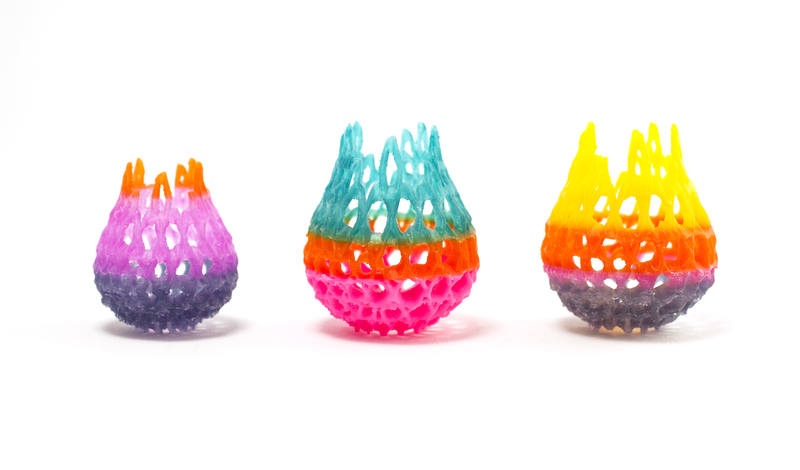 Faberdashery filament in (left to right and bottom to top): Dark Sapphire, Aurora, Orange Fizz, Punk Star Pink, Orange Fizz, True Lagoon, Dark Sapphire, Orange Fizz and Lemon Drop. I can’t wait to try out all the other very appealing colours on their website! Since getting my UMO+ up and running I have been building up to trying out flexible filaments. I was so excited about printing flexible structures for my research that even before getting the printer I had ordered several spools of filament from different sources – without really checking whether it would be compatible with the printer! I thought as long as it was the right diameter (between 2.85mm and 3mm) it would surely work. 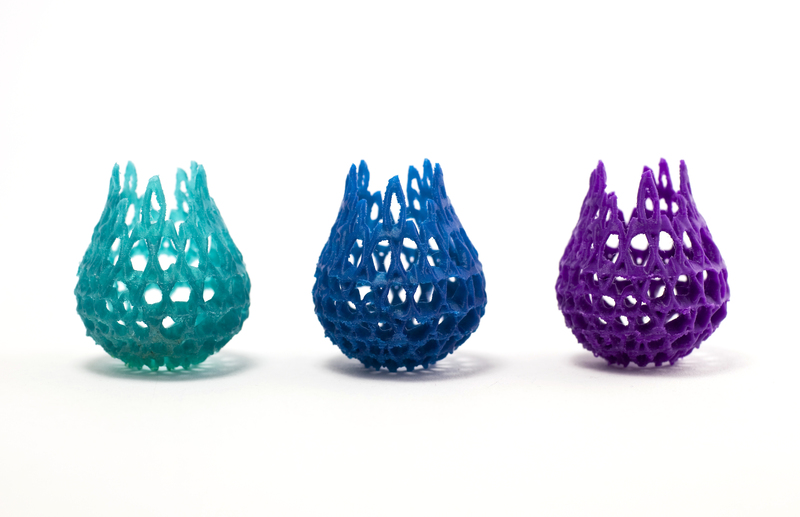 I cannot emphasise enough that it is really important to understand the limitations of the different types of 3D printers out there. 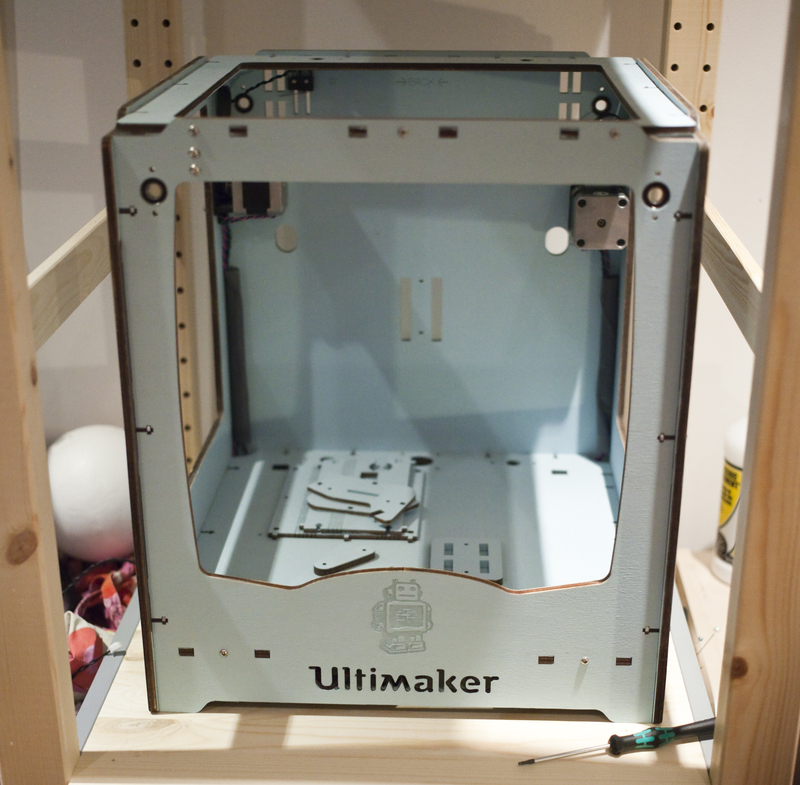 The Ultimaker is a Bowden-type printer – the filament is pushed into the hotend through a 70-80cm long plastic bowden tube by a material feeder mounted to the back of the printer. In other words, there is a distance of about 80cm between the hotend and the feeder. For printing materials such as PLA and ABS this method works well – the filament is stiff and the force of pushing it translates reasonably rapidly, although I have read somewhere that problems with stringing and oozing on more intricate structures are more likely to occur because of a slight delay with retraction. For flexible filament however, the Bowden-type is probably the least suitable type of printer. The filament itself is already quite flexible, and the feeder squishing it forward through the tube causes a slight delay, meaning a lot of people experience underextraction or – even worse – terrible jams. Oh, and forget about retraction on intricate structures! The way forward here is to adjust the flow rate and printing/travel speed – you want to keep the material coming out of the nozzle as a nice steady ooze and then prevent stringing as much as possible by making the nozzle whizz over the print. There is a great flexible filament comparison thread on the Ultimaker forum, which was my starting point before embarking on my first tests. I am really pleased with the quality of this print – if anything stringing is even less of an issue with the flexible PLA than with normal PLA, making for a cleaner print and less tidying up afterwards. However, I was a bit disappointed at first about the flexibility of the shape – having expected something akin to silicone, this felt more like a very stiff rubber gasket. I looked up the shore hardness of the material and at A 92 it is at the harder end of the spectrum. 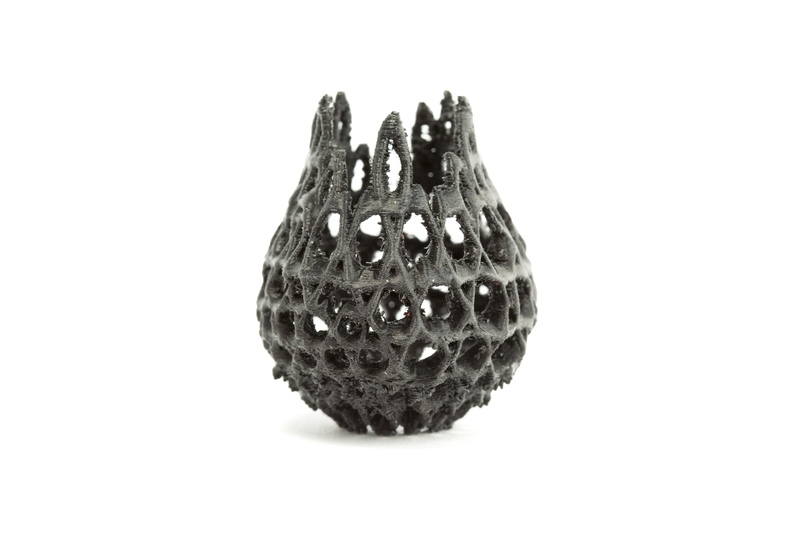 The middle shape was printed with the retraction turned on – a complete disaster both in terms of stringing and underextrusion. 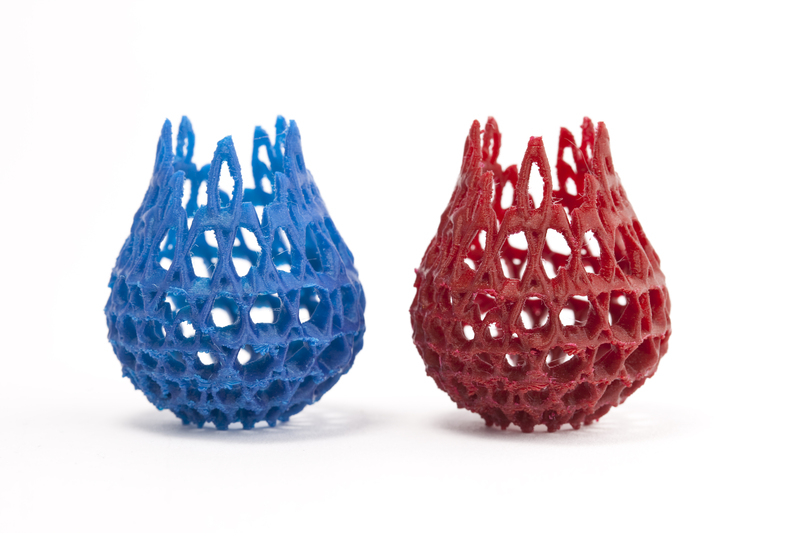 The shape on the right displays the best characteristics, which I achieved by turning up the printing speed to 150 and reducing the flow rate to 130%. These figures still need some fine-tuning, but I was pleased to achieve any type of acceptable results with the FilaFLex at all. There are still a lot of other flexible filaments to try out there, and these first results are very promising. For my purpose, the Ultimaker Flexible PLA is probably more suitable, but the FilaFlex might be interesting for some more experimental work. As some of you might have noticed, I am not the greatest at getting posts out quickly. I like the pressure of a looming deadline, hence always plan my projects so that I work right up to the wire. This blog is more about reflecting on past events rather than acting as a news bulletin of my practice. So, this very exciting event I was asked to be part of happened almost four months ago – on the 21st and 22nd of November 2014. DJCAD in Dundee was hosting a satellite event as part of the Crafts Council’s “Make: Shift: Do” programme, aiming to introduce the general public to new forms of innovation in craft with a series of exciting talks by digital makers and trying to get everybody involved by offering hands-on workshops. In Dundee, my lovely colleague and fellow ESRC PhD scholar Joanne Bletcher curated part of the event and managed to put together an absolutely inspiring exhibition of digital craft in the foyer of the newly refurbished DJCAD Matthew building. The morning session of talks by fellow digital makers included highlights such as a demonstration of Lynsey Calder’s thermochromic tutu, and textile artist Collette Paterson’s amazingly tactile latex and felt creations. Read all about it and more on the Facebook page dedicated to the event! 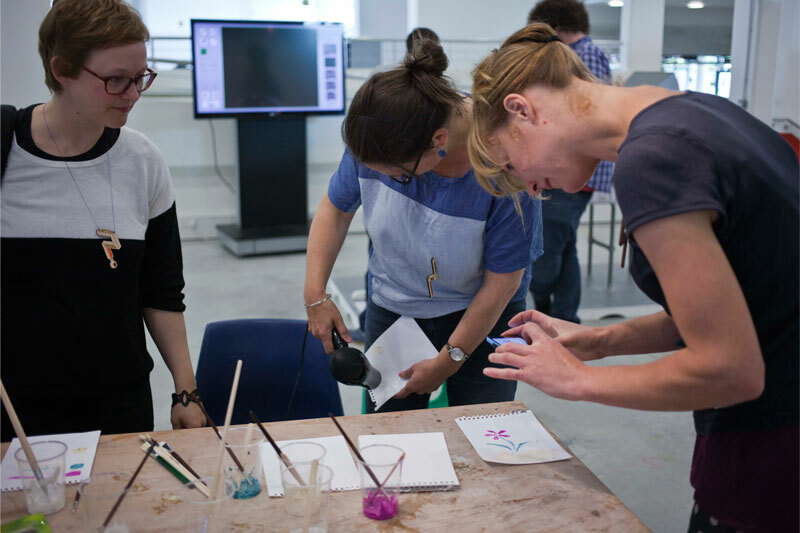 I was very honored to be asked to lead a workshop on working with thermochromic silicone in the afternoon, as well as take part in the exhibition. Here are some impressions of the opening of the exhibition. Enjoy! I love getting candid reaction shots at exhibition openings! Since getting my Ultimaker up and running, I have been avidly researching the most wild and wonderful types of filament to print with. There have been a lot of exciting developments in the unusual FDM (Fused Deposition Modelling) filaments sector recently, and it seems more filaments are getting announced every day on Kickstarter. I am starting this series of posts of some of the ones I am most excited about at the moment, although this list may change in time! I love the chalky texture of the surface, and how it makes the cocoon look like a calcified fossil. 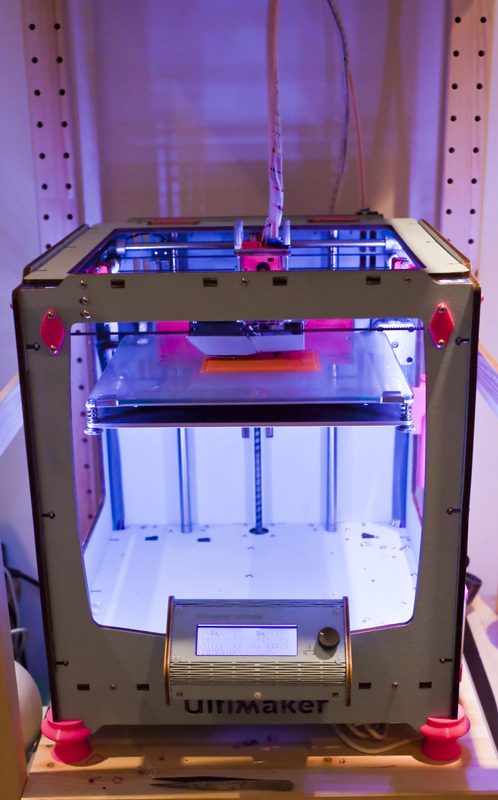 Check out this extended printing guide on fellow blog Extrudable Me! This material will definitely be used for my work in the future – it is very akin to the texture and feel of the z-corp ceramic material, the qualities of which I’ve always adored. The only downside is nozzle wear – the UMO’s brass nozzle is no match for the fine ceramic particles, which means over time the nozzle will be ground down and lose definition. This is the case for a lot of exotic filaments and is just something that I might have to accept by keeping a spare nozzle in reserve. 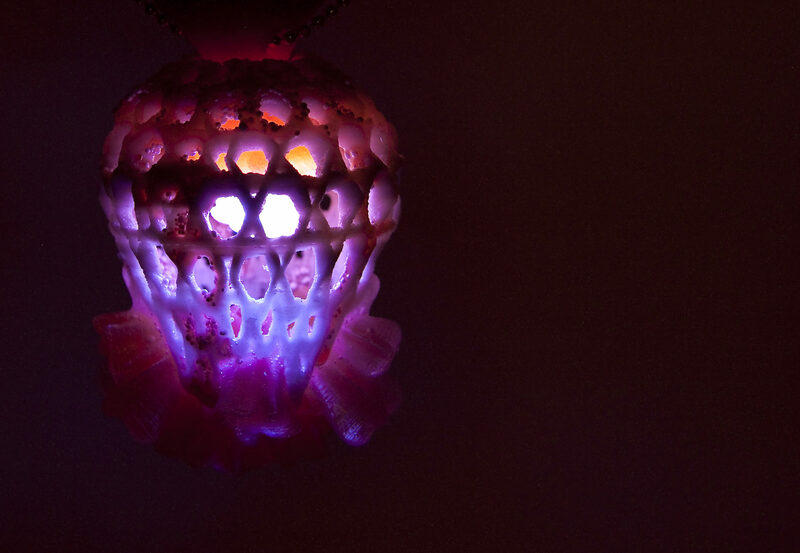 Kai Parthy has just announced MoldLay, a filament developed for the lost wax casting process, which I am sure jewellery designers around the world are as excited about as I am! FormFutura also brought to the market porous and felty filaments under the umbrella name PoroLay, which I am dying to try out next for their flexible characteristics. Watch this space! So, after deciding to go with the kit version of the Ultimaker Original +, the fun started at the beginning of December with the arrival of a pleasingly heavy box on my doorstep. At this point I would like to say that I absolutely love online shopping – the postman is to my mind a much improved version of Santa, delivering goodies to your doorstep all year round :). Inside the box awaited three layers of components, with the laser cut plywood frame pieces at the very bottom. Getting these to my house unscathed had been my biggest worry, but luckily everything was well wrapped and nothing was damaged in transit. But hold on! No packing list. I had literally no idea what anything was (only a few of the plastic bags were labelled) and so went into a mild state of panic. Luckily for the first step of the assembly process no instructions were needed – lightly sanding and painting the plywood parts. I had been to the DIY store earlier and decided on a colour scheme of satin blue for the main body and fluorescent pink for the moving parts. Mixing the paints with water to thin them down and adding custom pigment was something I had read about on various Ultimaker blogs, and it worked an absolute treat, leaving a lovely translucent matte finish. This step took a lot longer than I thought, especially as I wanted to preserve the beautiful dark laser-cut edge on all the pieces. After I had painted all the sating blue structural parts, I started assembling the main frame. My studio is starting to get a little crammed with me adding more and more gadgets over the years, so I had to start expanding upwards by modifying a huge ikea shelf with a pull out platform. It’s the perfect size for my Ultimaker, and the shelves above hold my collection of various filaments. The assembly process itself took about seven days in total, and there were various bumps in the road as the parts were not fully labelled (particularly the multiple bags of screws) and such operations rarely go completely smoothly. But by the end of December, as 2015 was dawning, my Ultimaker was fully pimped and ready to go…and here it is in all its glory, my ‘girly’ Ultimaker Original + as one of my (male) friends called it – with mood lighting! With Santa having clearly read this blog and listened to my prayers, it was no wonder that (with the help of my savings account) his little elves were busy this Christmas and left a pleasingly large parcel on my doorstep! 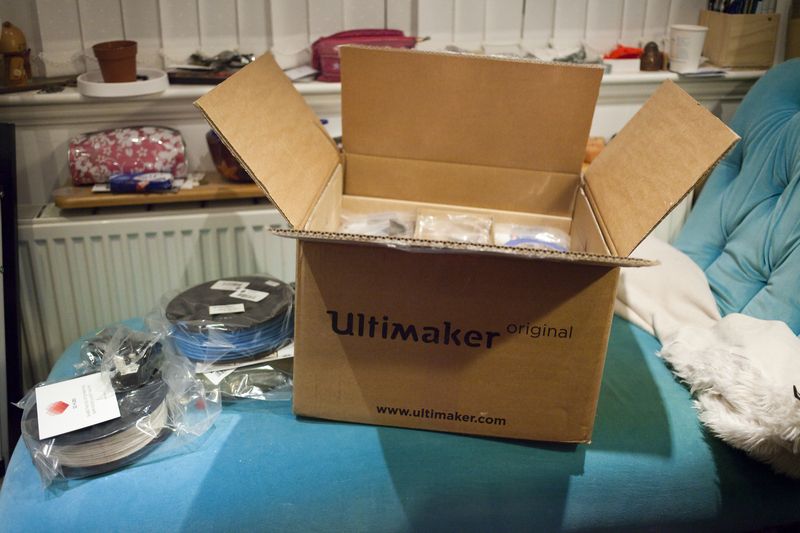 My new Ultimaker Original + kit had arrived – Squeee! As a true techno-nerd-in-training it had to be the kit version for me – and just as ‘Santa’ was busy researching the options, the new UMO+ came out, with a heated bed and improved z-stage. If you’ve followed my admittedly sporadic postings, you will have read that at an earlier point I had considered Makerbot and the UP. Well, I have become thoroughly disenchanted with Makerbot in the meantime, mainly because of their withdrawal from the open-source community and the dodgy IP controversies surrounding Thinigverse. I believe in open-source, and have been following the recent commercialisation of the personal 3D printer market with great worry. There are fewer kit products now the market now than when I started this research project, and the general trend to provide a finished ‘out of the box’ printing experience – while not unexpected – is a great shame, particularly because if you know your machine inside out it becomes easy to diagnose and fix any problems that might occur. And occur they will, even the most sophisticated 3D printers eventually need to be maintained. The worst development in my opinion is the push of certain brands towards custom ‘cartridges’ of filament – do we really want 3D printing to go the way of the inkjet? Not me, and that is why the UMO+ was my choice. After a good two weeks of painting, sanding, screwing and wiring, my fully pimped Ultibaby was ready to go and produce its first test prints. And after ironing out a few kinks along the way, it has now been up and running smoothly for the last month. My studio is getting filled with brightly coloured bits of plastic in the meantime – don’t underestimate the power of the Ulti…. 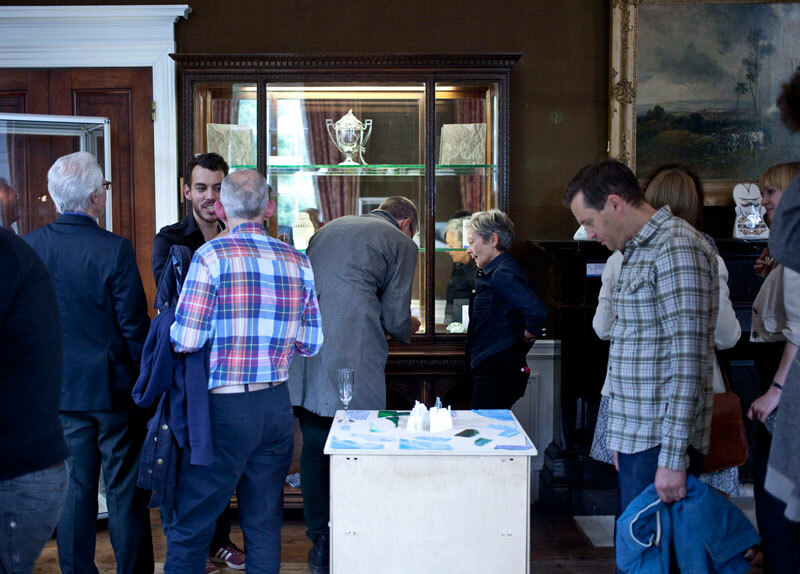 I recently took part in a really exciting collaborative project between the Sir John Soane’s Museum in London and the Royal College of Art alumni initiative In Tandem, supported by the Jerwood Foundation. For the project, the bust of Sir John Soane was digitally scanned to create a 3D model which was in turn divided into a number of fragments. Each participating designer was then given a digital printout of a randomly selected fragment to work with and design their own object in response. I was fortunate to receive an ear, which I turned into a temperature responsive wall sculpture with detachable necklace, based on architectural elements found within the Soane Museum. I wanted to create something that looked and felt almost organic while being connected intimately to Sir Soane, his collections and his house. The colour was inspired by the eponymous yellow south drawing room with its black architectural mouldings, while the shapes of the necklace were abstractions of the famous domed ceiling of the breakfast room and Sir John’s urn collection. The title “Soane’s Burning Ear” refers to a story about the betrayal of Sir John’s son George, who published an article in a prominent architectural journal deriding the architectural practice of his father. This has come to be seen as a turning point in Soane’s life as the shock was allegedly responsible for the death of his beloved wife Elizabeth. The title “Soane’s Burning Ear” plays on the expression “My ears are burning”, and reflects Soane’s anger and disappointment with his son after this episode, expressed through the red colour of the silicone. The object itself consists of two parts – the fragment of Sir John’s ear, taken from the bust and coated in a temperature reactive silicone and a 3D-printed pendant made from SLA plastic with a black, facetted sterling silver chain. The ear fragment acts as a holder for the pendant, and can either be displayed as an object or hung on the wall via the small hook on the back. When the pendant is detached, the ear becomes clearly visible, and a piece of the pendant seems to stay behind, giving the impression of Sir John wearing an earring. When the temperature of the fragment changes, for example through prolonged touch, direct sunlight or a rise in environmental temperature, the silicone changes colour and slowly transitions from dark red to bright yellow, blending in with the pendant and thus unifying the piece. This change is symbolic of time passing and obscuring the emotional turmoil of the past, shifting the focus onto the fragments of Sir John’s legacy as an architect and collector. An exhibition of all pieces from this project at the Sir John Soane’s Museum will be open to the public from the 4th – 22nd of November 2014. 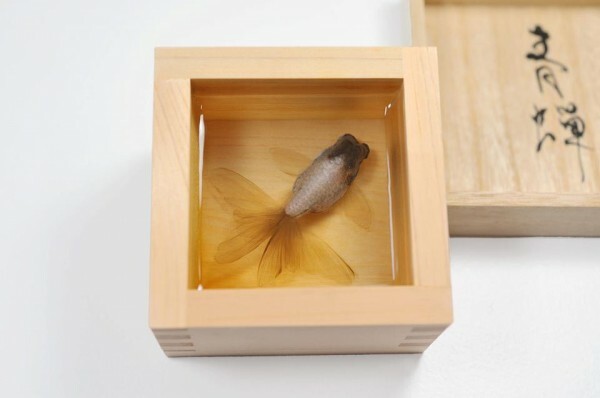 Today I came across the work of a very cool Japanese artist who takes the concept of 3D printing back to more traditional techniques – Riusuke Fukahori. 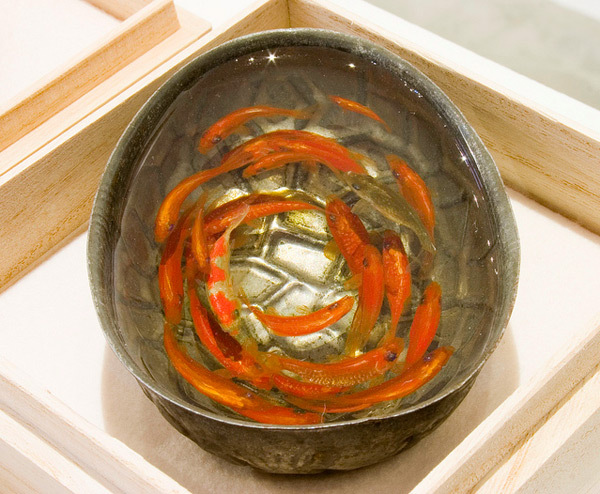 Obviously a lateral thinker, Fukahori uses traditional painting techniques and glass clear resin casting to create almost hyper-real sculptures of fish swimming in bowls. 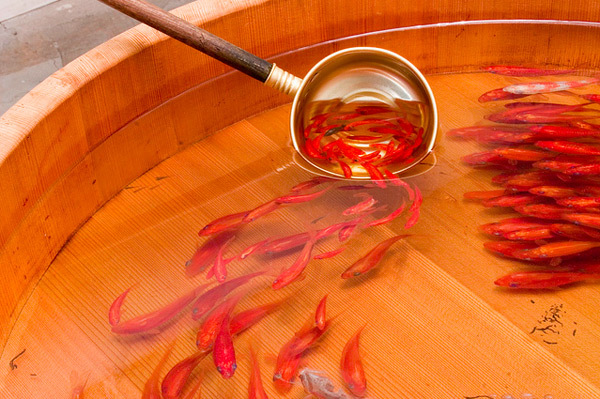 He painstakingly paints small fish on layers of cured resin, adding more resin after each layer. 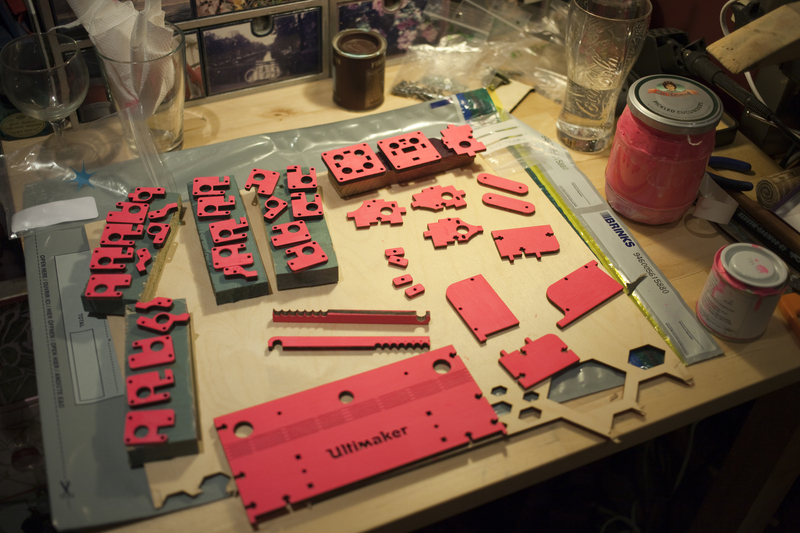 In that way the process works exactly like 3D printing….except with paint and resin. Check out his amazing work, including a video of his process here. After returning from the very inspiring All Makers Now? Conference in Falmouth, I am buzzing with ideas and projects to add to my research. I met so many interesting researchers, artists and tinkerers in Falmouth, all working around the same themes and problems as me. 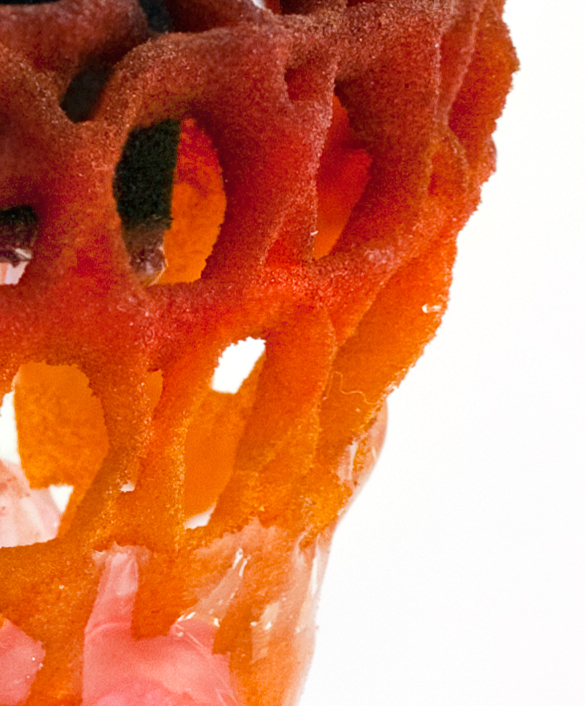 One of the most interesting discoveries was that of a website detailing recipes for using alternatives to the expensive materials supplied for the Z-corp 3D printer. While we had long suspected that the special white powder used in these machines is in fact plain plaster powder, research teams at US universities have started to tackle this head on by finding viable alternatives to bring down the cost of printing. As these printers need to be used regularly in order to keep working, this is a very welcome development. 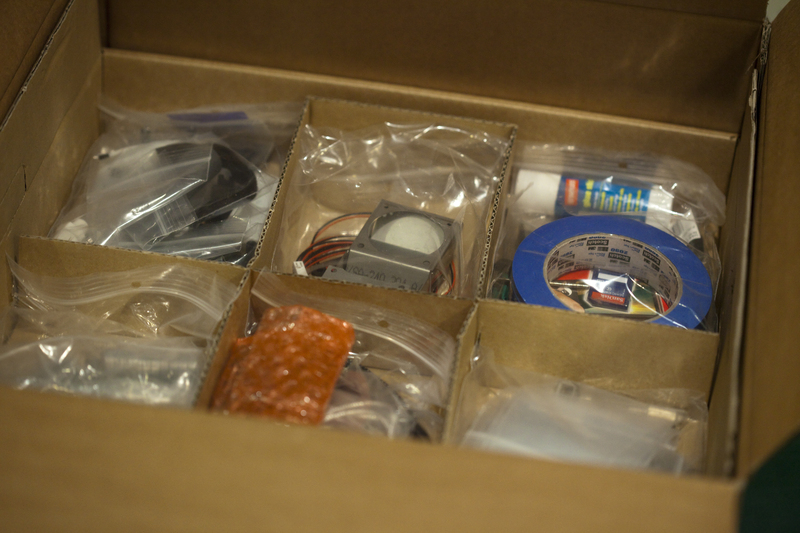 Cost is a major deterrent when it comes to creativity and experimentation, so hopefully I will be able to get some gears moving and try some of the recipes in our machine. The recipes can be found at http://open3dp.me.washington.edu/, alongside lots and lots of other cool hardware and software projects all things 3D. More exciting discoveries I made at the conference to follow soon. Now a summer of conferences and site visits is drawing to a close, it’s time to buckle down and finish writing that chapter of my thesis. But first, some impressions from the All Makers Now? Conference…enjoy! After a prolonged absence I am yet again resuming my research and thus this blog. And what better way to ease back into the swing of things than with a fun project. I have a few projects on the go at the moment, but the one I have just finished is the Jewellery Exchange, as promoted by Olga on Facebook. I believe 370 participating contemporary jewellery artists got partnered up with one another and agreed to make and swap a piece each by mid-April. I just received my piece in the mail from my partner Safira Blom, who is based in Sweden, this morning and I am absolutely delighted with it. My own piece made its way to Sweden last week and I think it was well received. 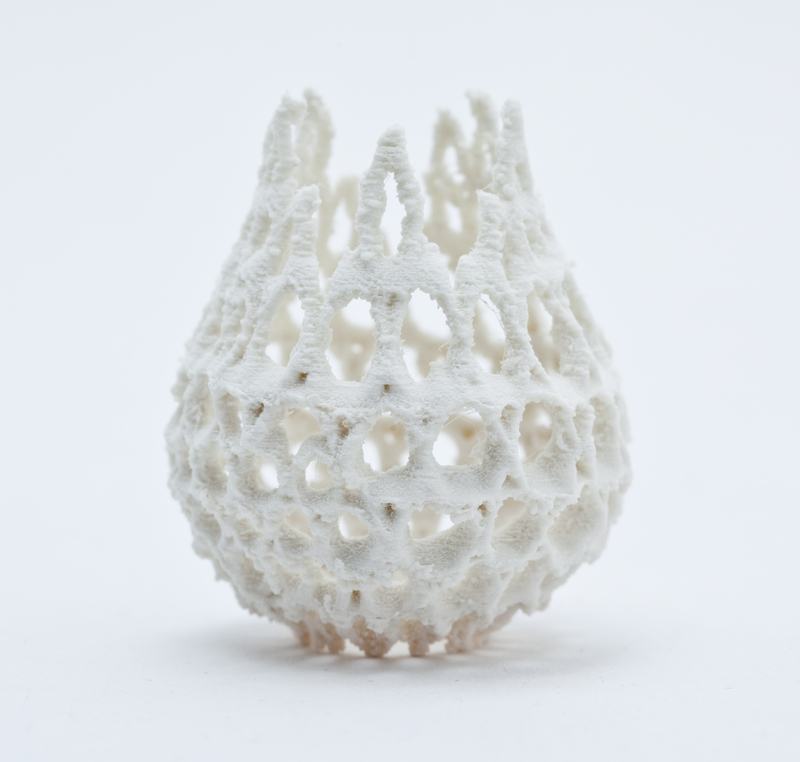 Incorporating 3-D printed elements and my signature thermochromic silicone shapes, it is the first of a new body of work I am currently developing, based on Macro images of cells, structures and minerals. Unfortunately we are not allowed to release images of the finished pieces before the jewellery exchange website has been unveiled, so instead I am posting a tiny glimpse of its structure in extreme close up. Enjoy! 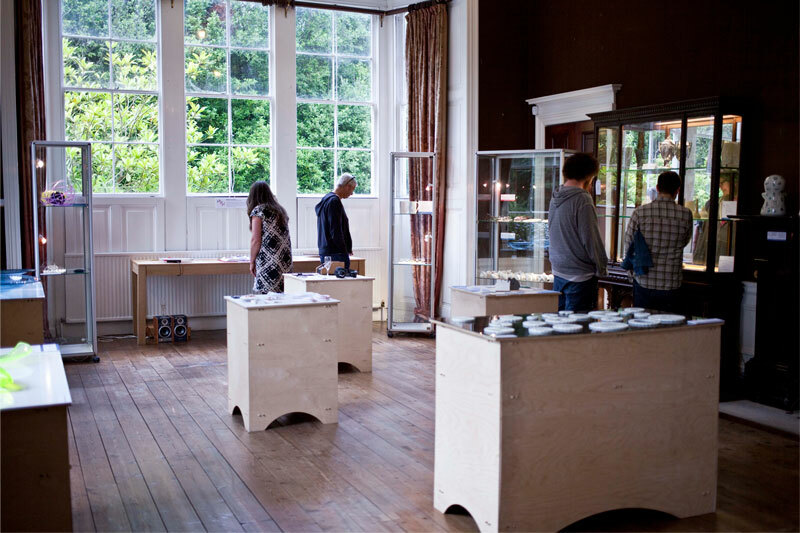 I am a Jewellery artist, Lecturer and Researcher based at Edinburgh Napier University. 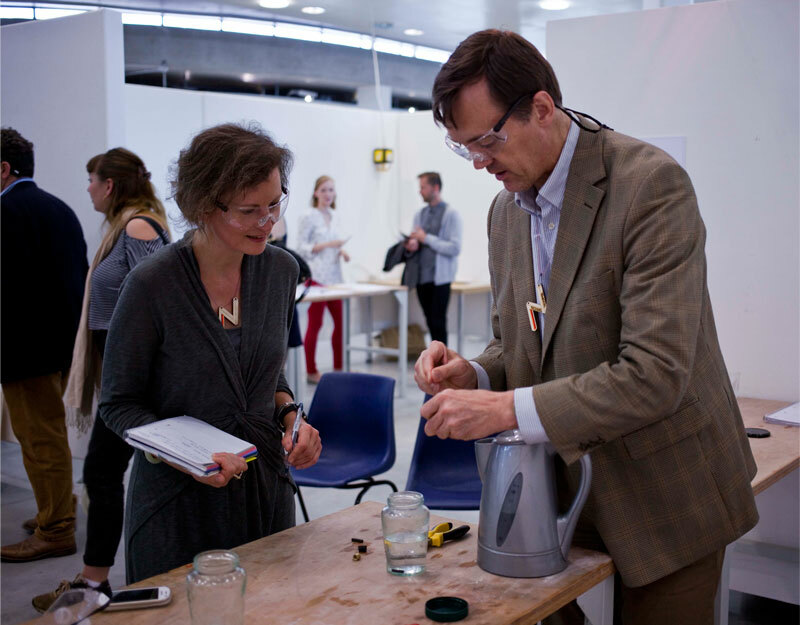 My research focuses on creating stimulus reactive jewellery from smart materials and microelectronics. Here, I will be blogging about the weird and wonderful materials, processes and people I encounter on my journey. To see my jewellery creations, please visit my website.